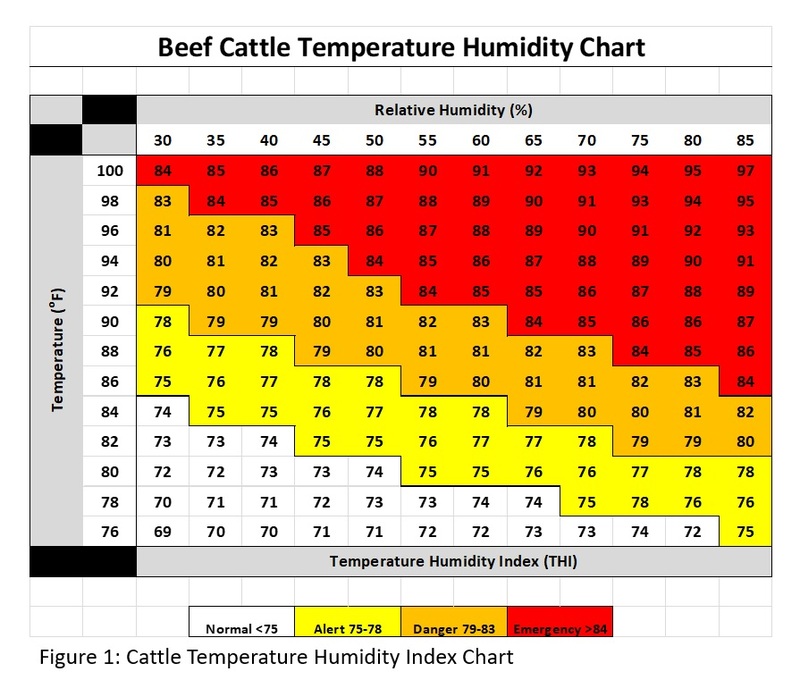 The Cattle Temperature Humidity Index Chart will help to determine the risk level in planning cattle handling during the summer months. As cattlemen enter the summer months, they need to understand and deal with heat and humidity. We need to consider some guidelines to help us reduce additional stress on cattle during these events and incorporate some of the following practices into our management practices. It is first important to understand the relationship between temperature and humidity in respects to the Temperature Humidity Index (THI) or Heat Index. Figure 1: Cattle THI Chart, will help to determine the risk level in planning cattle handling during the summer months. Cattlemen need to be aware of the risk based on weather forecast of the heat stress. Another useful resource in determining an animal’s heat load is body temperature. However, in larger commercial setting this is not a feasible method to determine heat stress. An alternative to this is determining an individual animal’s panting score. Panting score can be a good indicator of body temperature. As the temperature, humidity, and THI increase the panting scores will increase as well. Panting scores are determined on a scale from 0-4 and are assessed as follows (Figure 2). Handling cattle early in the mornings before temperatures get too high is always recommended. Plan to handle cattle before 8:00 a.m. and never after 10:00 a.m. during summer months. Remember that the animal’s core temperature peaks approximately two hours after the environmental temperature peaks, and takes four to six hours to lower back to normal temperature. With this in mind you shouldn’t believe that handling cattle in the evening will reduce the risk of heat stress. When processing cattle during high heat seasons, work cattle in smaller groups, so cattle are not standing in the holding area much longer than 30 minutes. Cattlemen should consider facilities that are shaded with good air flow to help reduce the heat. A sprinkler system may assist in cooling the area, if the water droplet size is large. Never over-crowd working facilities, work cattle slowly, and use low-stress handling techniques. Remember that processing cattle in any temperature elevates the animal’s core temperature. Cattle movements should be short distances during hot seasons. Strategic planning on pen movements can assist in reducing unnecessary movements and potential heat stress. Moving heavier cattle closer to loading facilities throughout the feeding period can benefit in managing heat effects. When planning or improving cattle handling and feeding facilities, cattlemen need to take into consideration air flow, shade, and sprinkler systems for cooling livestock. These considerations can help the danger of heat stress on livestock and improve feeding efficiencies during hot temperature periods. Another important thing to remember is that compromised animals are at higher risk for heat stress. Those animals that are sick or lame are usually running higher temperatures than normal (average temperature for a beef animal is 101.5 degrees Fahrenheit), combined with hot temperature and high humidity raises their risk of heat stress. Producers will need to take extra precautions with these animals to provide additional resources like shade and cooling. Summer can be challenging for many cattle producers. By implementing some handling guidelines, cattlemen can reduce the risk level of heat stress and improve cattle performance. The Nebraska Beef Quality Assurance website, http://bqa.unl.edu, has additional resources and links available for more information on cattle handling, processing, and facility design. For more information about Nebraska Beef Quality Assurance or to get BQA certification, contact Rob Eirich, UNL Extension Educator and Nebraska Director of BQA at the UNL Panhandle Research and Extension Center 308.632.1230 or reirich2@unl.edu.